* Club Event Map: [Clickable link to Google Maps] ( details updated 10th December) / # Club Points event. Febook: https://www.febook.com/BARunnerUK/ (formal "front window" club page), BA Runner Febook Group (informal "bk office" - ask to join). Join us on Wednesday for a training session that will involve a warm-up, some 200 or 400m sprints and then an exercise in the dark! Bring your GPS devices if you have them. I'll be at the club from 17:45 and we'll start shortly after 18:00. There are changing rooms with hot showers. There will be a social afterwards in the right-hand bar. The club isn't providing food for this social but if there is demand then we can phone for a takeaway. Thanks to Chris Kelly for taking the photograph. Ian Cunningham, Gary Rushmer, Graham Taylor and Steve Hillier for making up the team this week. place in the Div 4 individual standings at senior level. What a great debut season for him. It is a few years since we challenged below the vets levels. If we get our strongest team out for the next event then hopefully we can secure that 8th spot despite the expected absence of Adam who will be on holiday. Now, I wonder if he is using staff travel?? With ten to score it was great that everyone who did turned up including Steve who enabled those ahead of him to push themselves to better results. With a total of 704 points the team was still only 10th of 12...but that is better than being 11th or 12th! The club has had a "Round-the-Block" race around the streets of Cranford and Heston since the early 1980s and we've no intention of stopping now. Hopefully you will be able to join us, as a generous lunchtime break from your work locations, or from your retirement cottages. Over the years the course has been the same other than we've slightly varied the start and finish location and therefore the distance between them. In the early '80s the course was one full lap starting and finishing on the green just the south side of the Motorway bridge where Cranford High Street becomes Southall Lane. We'll do the full lap this year, which I've GPS measured at 3.4miles/5.5k, and either start at that green or nearby. The course is shown on the club map. Note that we have no access to either the Heston Venue or Cranford Community College so participants will need to arrive ready to run and return whence they came to shower and change afterwards (perhaps via the Queen's Head first). So, if you fancy taking an Officials course, do let me know. We have a supportive audience of club members, who are happy to let you practice your new-found skills on them! Steve's away so some efforts may have been missed. You are invited to remind us of them. Another bumper helping of parkrun results, covering the last two Saturdays. Not much to report for the 5th other than Roderick had his second run at Victoria Dock and proved that the course there is fast by getting his best age-grade result for 3.5 years. The course is very similar to that we used for WARR in 2010 so its surprising more colleagues haven't made it over there for a revisit. On the 12th club members ran at two new parkruns for the club - Janet Smith at recently started Jersey Farm near St Albans and Roderick at Nobles parkrun which is on the Isle of Man - just a one-hour flight from Victoria Dock on a Loganair aircraft for City Flyer for BA...and like most from London City the flight is still catered! There were fewer men in the results because of the Cross Country but didn't the ladies do well! It isn't a race, but it is still nice to be able to report first lady finishes for both Kay Trinder at Brooklands and Maria Jovani at Kingston. Maria now has the fastest club time at Kingston beating both Natalie Ruffell's and Gary Rushmer's previous records. Jacqueline Musselwhite was second lady at Bideford where she runs once a year. Perhaps next time she can try out nearby Woolacombe Dunes that had their 5th run on Saturday - a tough half beach, half dunes run. Good to see Joe Nolan posting a reasonable finish time at Black Park. After missing out on New Year's Day and last week Alan Anderson ran at Osterley - a parkrun set-up by former member Geoff Miles who appears to have been an un-credited extra tail-walker on Saturday. More record weeks on both Saturdays - 307 of the UK's 602 parkruns have had their records broken on or since 25th December 2018. Bushy, Southampton, Cardiff, Poole and Clapham Common all had over 1,000 runners. In total in the UK over 180 thousand people ran or walked at a parkrun last Saturday, last year's record had been 136 thousand. Worldwide the figure was 320 thousand, up from 249 thousand. Putting this in perspective, last Saturday's UK runs mean that parkrun UK need to provide approximately 3,600 free tee-shirts due to the runs on Saturday alone - and that doesn't include the volunteer shirts! Expect to receive more sponsors' messages. Former member Natalie Ruffell ran well at Greenpoint in Cape Town, finishing in 18th place, 2nd lady. I had previously run at Greenpoint on 5th October 2013 in a field of 134 finishers. That was the event's 12th run and the founder was concerned because he was leaving the area and was worried that no one would take his place and the event would cease - and leave Big Bay as Cape Town's only parkrun. However, the event carried on and Natalie was in a record field of, wait for it, 1288 runners (though all those beyond 1202 are "Unknown" perhaps due to a results issue). There are now 13 parkruns in Cape Town and the surrounds. Big Bay is run on the beach but was cancelled on Saturday because of high tide conditions. The other 11 Cape Town parkruns had a total of 7,444 runners and two were larger than Greenpoint. Away from Cape Town Root44, where many of us ran the following week in 2013, had a modest 1094 runners. 17 South African parkruns had over 1,000 runners. North Beach is normally the largest but this was cancelled on the day due to massive crowds on the promenade (also due to an unrelated rally). See you on Saturday at Higginson parkrun, Marlow and try to arrive early so that you can grab a parking slot and be near the start for a start line club photograph. If you have to pay for parking please allow generous time for us to chat in the cafe afterwards. Let me know if you need a lift from the Heston area (or anywhere else) to Marlow. 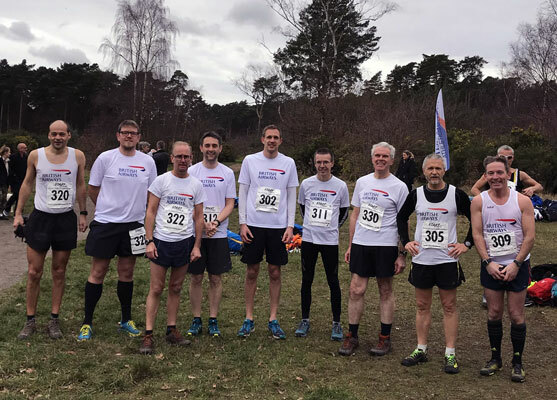 We have chosen the date of Sunday 17th March for the BA Cross-Country and as usual the location will be Cranford Park - probably with a start time of around 10:30. 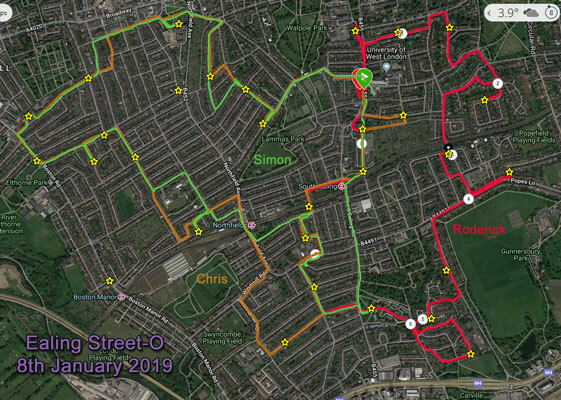 The map shows the different courses that Roderick Hoffman (red, clockwise), Chris Kelly (brown, anti-clockwise) and Simon Turton (green, also anti-clockwise) ran last week at the Ealing Street-O event. Jain Reid also ran - running with me up until the white 3k circle and then forging her own way. You'll note that Chris and Simon chose to run between the same control points (the stars on this map) but not always by the same roads. Different controls were worth different numbers of points - the lowest is worth just ten points which is why we all ignored the star nearest Boston Manor station. There were 77 competitors and, on her run, despite learning the hard way how many time penalties there are in eight minutes, Jain avoided last place finishing 73rd with 148 points. Roderick finished in 34th place with 387 points and is currently in 18th place in the season's standings (from the maximum of five results). Simon and Chris managed to tie in 18th place with 470 points and Simon is currently 12th in the season's standings from just four events. 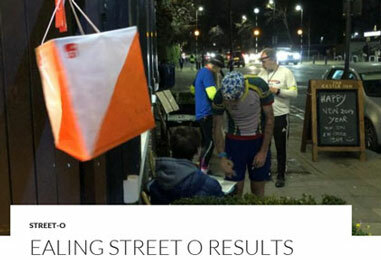 The next Street-O event is on Tuesday 12th February at Kentish Town. PS The photo above is off from the Orienteering website with Jain on the left and me on the right - synchronizing our watches before the start.